When working with Oracle Management Cloud, you’ll likely need to deploy an agent at some point. In this example we’ll deploy a Gateway to facilitate communication from my on-premise systems to the Oracle Cloud, and a Cloud Agent which will upload metric and log data. For details on agent and network requirements for communicating to Oracle Management Cloud, see this previous post. The Gateway agent is typically the first agent I deploy when working with customers. While it is an optional component, it adds a lot of simplicity to a deployment, especially when monitoring systems on-premise. The Gateway acts as a funnel, so all data from your on-premise systems is sent to the Gateway, and then bundled up to be sent to Oracle Cloud. This allows us to only open outbound access from the Gateway servers to Oracle. All other communication is done internally. Install location must have sufficient disk space. This can be 10+gb depending on the size of your deployment. The more space available the longer data can be buffered in event of communication error. Multiple Gateway agents can be deployed for high availability and load balancing. Copyright (c) 1996, 2018 Oracle Corporation. All rights reserved. Cloud Agents are responsible for the bulk of work in Oracle Management Cloud. They are used to collect configuration and metric data, run orchestration jobs and compliance checks, as well as upload log files. They can be deployed on any supported host or vm. Install location must have sufficient disk space. Minimum is 1gb however we recommend 4-8gb dedicated space. The more space available the longer data can be buffered in event of communication error. 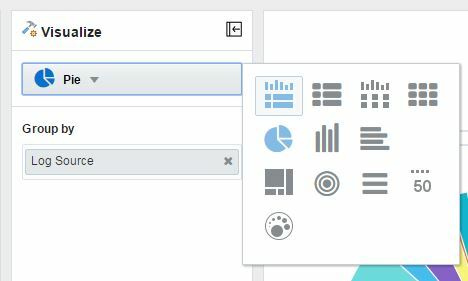 After installing the Gateway and the Cloud Agent, you should be able to see data in Oracle Management Cloud. If you go to Administration > Agents, you’ll see the newly installed Gateway. Validate the time since last check in in the highlighted column. This indicates the last known communication from the agent. Click on the Cloud Agents tab and you should see your Cloud Agent. Validate the time since last check in is current. Gateway and Cloud agents can be deployed on premises or in your Cloud targets. Basically anywhere you can transfer the file and run the install command. Once deployed, you can begin monitoring hosts or supported entities, as well as collect log files from that host. 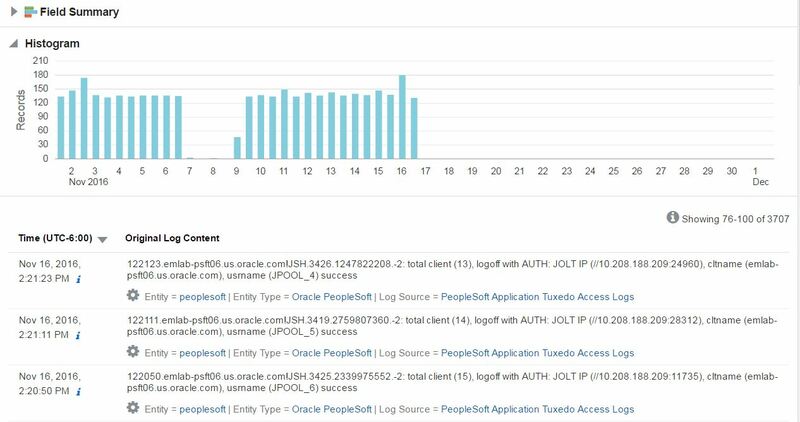 I’ll also discuss integrating with Oracle Enterprise Manager in a future post to show you how to leverage your existing monitoring and extend with OMC. Updating and reposting to reflect current state as of today for agent install and tenants. Lately I’ve been busy helping customers deploy the new Oracle Management Cloud (OMC) services and discover what it can do for them. One of the most frequent questions I get when talking with new customers about OMC is how do we collect the data and send it to Oracle’s Cloud? 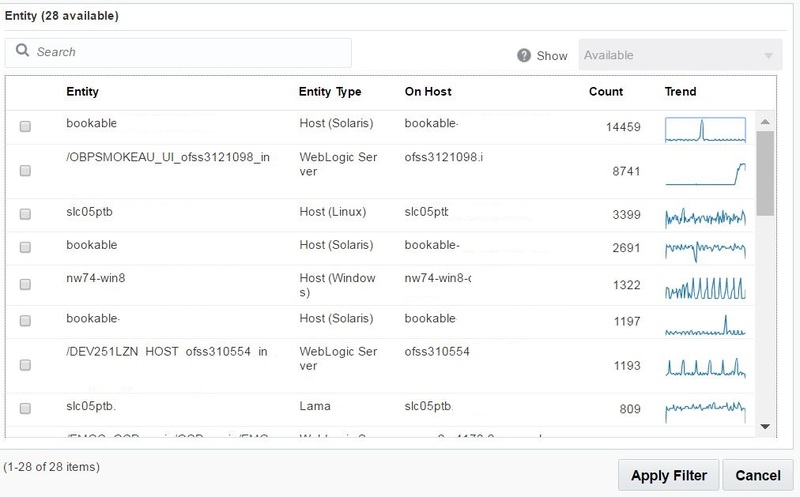 Using Agents installed on-premises or in the Cloud, we can collect various points of data to be used in the many services that make up Oracle Management Cloud. The goal of this blog is to introduce you to our points of communication and explain where we get data and how it’s used. It’s important to note, all communication is outbound from Agents to Oracle Cloud. There is no inbound communication. All agent communication is over HTTPS. If your systems have direct access to the internet, they can communicate directly. Most enterprise customers will likely configure a proxy or firewall/ACL changes to allow communication over certain servers and ports. You must be able to reach this URL. Whether it’s via proxy server, or firewall, the agent does not care so much. Just that it can communicate. To test this, you can use curl to see if your particular server can reach the tenant. The rest of this blog post will discuss the various agent components and how they communicate with each other in a typical Oracle Management Cloud deployment. The Gateway is an optional component and is used to buffer and send all data from Cloud Agents, APM Agents and Data Collectors to the Oracle Cloud. This way, only one server has to have internet access. Due to the amount of activity for buffering data, this may require a standalone machine as the CPU utilization can be up to 20% for large environments depending on the number of agents and volume of data being sent. All communication from Gateway agent to Oracle Cloud is over HTTPS (port 443) and is outbound only. 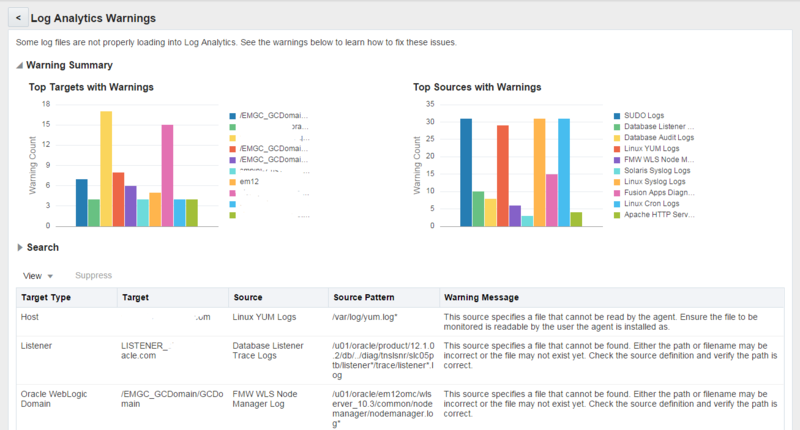 The Cloud Agent is responsible for collecting log, metrics, performance, configuration, orchestration jobs and compliance checks to be used in the various services (Log Analytics, IT Analytics, Infrastructure Monitoring, Configuration & Compliance, etc). It is also responsible for executing remediation actions or instructions per Orchestration service. This agent will sit on the target host, whether on-premises or in a Cloud. The agent can communicate to OMC directly, via a proxy, or the Gateway. The Cloud agent communicates to the Cloud over HTTPS (port 443) directly, or to the Gateway agent over the port the Gateway was installed on (default is 4459). 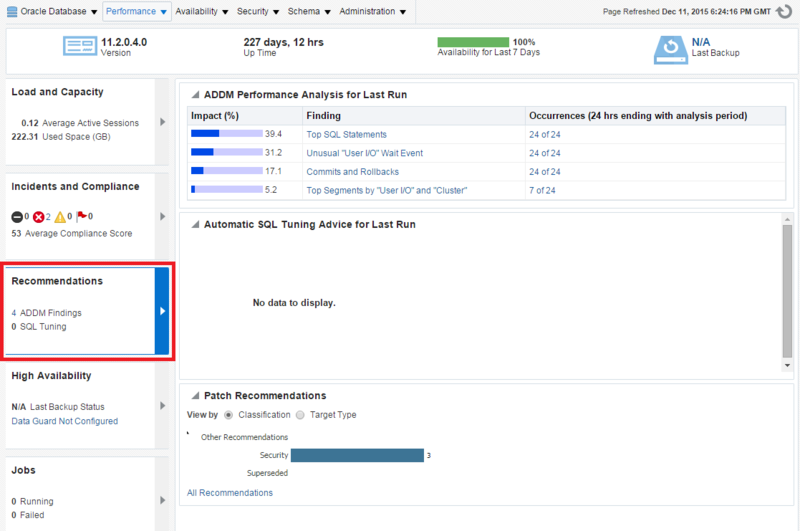 When using Application Performance Monitoring (APM), you’ll be using the APM agent which is installed on the server where the application runs. Whether the application is Java, .Net or Node.js, the agent collects and sends performance data about the application to OMC. This agent can communicate directly, via a proxy, or through the Gateway (over HTTPS on Gateway port). As APM also collects End User Metric data from the application users browser, that data is sent directly to OMC. 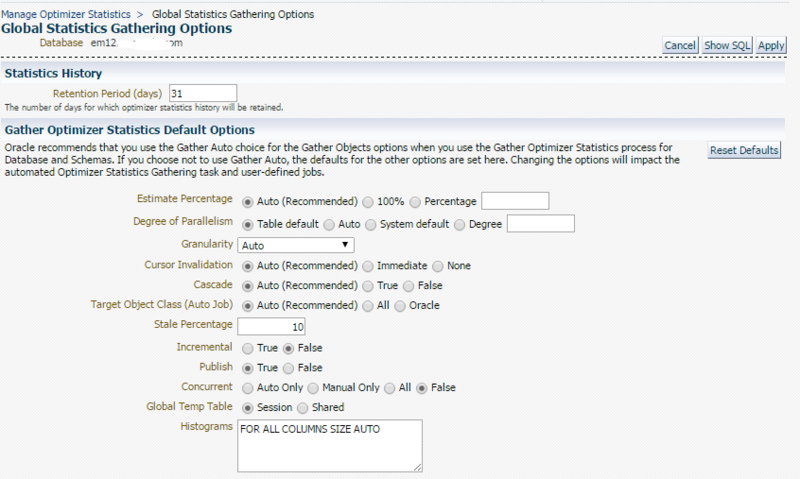 There is also an optional Data Collector component for users who already have Oracle Enterprise Manager (OEM) configured. 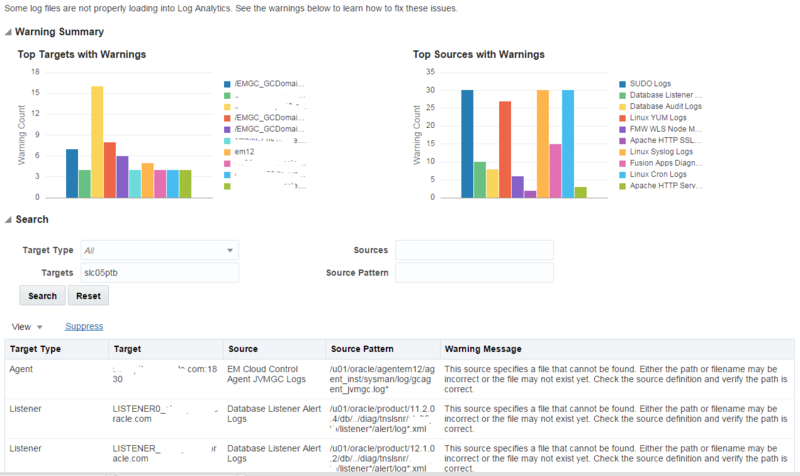 The Data Collector extracts target properties, associations, metrics, incidents, version and additional configuration data about the targets in OEM and shares this with OMC. The Data Collector talks to OMC directly over HTTPS or via the Gateway (over HTTPS on Gateway port). You can have multiple Data Collectors if you have more than one OEM configured. This is a great opportunity to consolidate data into one place if your OEM is separated by organization, geography or lifecycle status. As each agent has a different purpose, their install parameters are slightly different. Details can be found in the installation docs referenced at the end of this blog. Since Oracle Management Cloud is an agile product with monthly releases, the agents may be updated monthly as well. This does not mean you have to upgrade your agents monthly, but upgrading quarterly will keep your agents in top shape. For Gateway, Cloud and Data Collector agents, when you’re ready to upgrade simply go to the Agents administration page and select Upgrade. This will instruct your agent to download the latest agent and perform an out-of-place upgrade seamlessly. If the upgrade fails for some reason, your original agent will remain active. APM agents must be upgraded manually as they’re tightly integrated with the application. These should be built into your application update cycles. Not that you’d want to deinstall Oracle Enterprise Manager (OEM) 13c, but I just have to tell you how easy it is now! This was one of my pet peeves in OEM 12c. Deinstalling had a list of about 20 steps, and the order was very particular, as was the alignment of the sun and moon. Not anymore, in OEM 13c, it’s one command and it’s beautiful. Really, it’s the simple things that make me happy! This may not be a common concern for most people, because once they install they just continue to upgrade and move forward. However when you do a lot of testing (especially destructive testing) and you have to rebuild your environment frequently, this is a big deal. Want to see how easy it is? First, be sure to start with your environment up (repository database and OMS). Then run it. Be sure you have your passwords and Oracle Home handy. Again. It’s the simple things that make me happy. For more information checkout the deinstall docs, there’s additional ways to deinstall certain components, but when you’re looking for a clean sweep this is the trick. Stopping oms………… Wait for the completion of the execution. The oms delete will take sometime. Wait for the completion of the execution. Don’t abort the execution. Repository drop will take sometime. Wait for the completion of the execution. Don’t abort the execution. Action on BIP schema succeed. Action on MDS schema succeed. Launcher log file is /tmp/OraInstall2016-08-01_09-18-50AM/launcher2016-08-01_09-18-50AM.log. Logs successfully copied to /u01/oraInventory/logs. The deinstallation of OMS is successful. You don’t have to be a technologist to know what STEM is. These days, you see STEM everywhere you turn around. Science, Technology, Engineering and Math. Some even add Art and make it STEAM. Whatever you call it, it’s critical for our kids to advance in this technology focused world. It doesn’t have to be all work though. There are some great resources that make learning STEM more fun then you can imagine. Our school is blessed with two amazing teachers, Noreen and Shelly, who are dedicated and excited about teaching young kids technology! Once a week, they spend a few extra hours helping the kids in our Jr Robotics Club. The club is open to kids 1st-3rd grade, boys and girls. Yesterday, I took an hour out of my day to spend some time assisting. It was so exciting to see how many young kids were excited and engaged with the robots they played with. Especially as a woman in IT, it was exciting to see how many girls were involved as well! 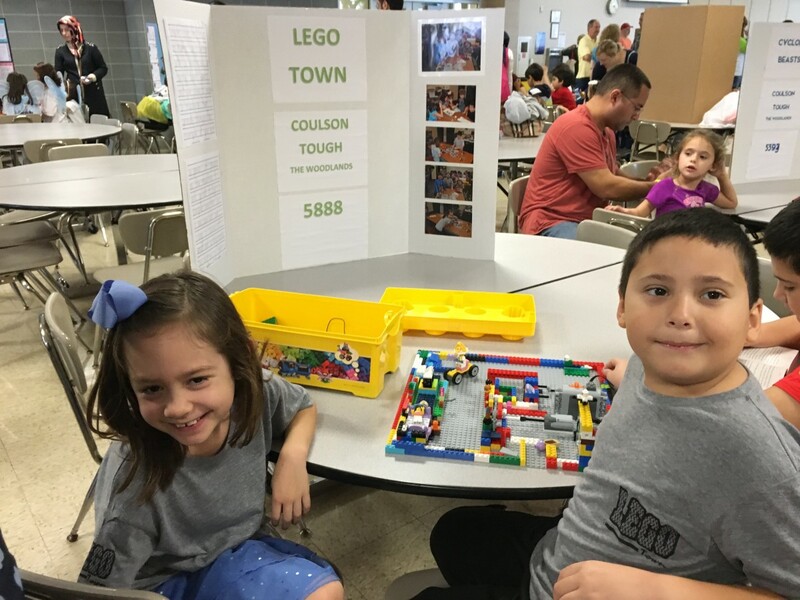 Initially, they focused on the early LEGO robotics as they were gearing up to participate in the FIRST Lego League Jr showcase in December. Our school had 4 teams create a “working LEGO project”. They had to create and build something that moved using the LEGO motors that related to this years theme on waste and recycling. My 7-year old son’s team, Tough LEGO Town, built a can recycling conveyor belt. They take their creation, along with a poster that shows their ideas, to a competition where they are interviewed by volunteer judges. As a parent it was thrilling to see them explain their creation and demonstrate it at such a young age. Another critical skill they’re practicing is working in groups, this is something many adults still don’t do well! Certainly nothing like what I was doing in 1st Grade! Using iPads or Laptops, the kids can code using Scratch. If you haven’t checked out Scratch, you should! Scratch was developed at MIT and is a great way to get kids using their creativity and thinking skills. They can create stories, animations, games, music and art, just the way they want it. You can start using Scratch on a PC or Mac at scratch.mit.edu or you can download the Scratch Jr app on a tablet. This is a great one to do at home too! My kids love to share their creations with their friends! The LEGO WeDo is the beginner version of their Mindstorm robotics. The build instructions are easy, and the software you use to program is very simple! The newest release just came out in January (too late for Christmas unfortunately). WeDo 2.0 is geared towards 2nd through 4th grade, though with parent help Kinder and 1st will also enjoy! The core kit comes with 280 bricks, a SmartHub power block, 2 motors, a motion sensor, storage tray, programming software and examples! You can see more in the video below. WeDo 2.0 is available for $159.95 from LEGO Education here, this is definitely on my Christmas list. We’re currently using the original WeDo sets, but the 2.0 looks like so much more fun! If you have older kids, 4th and up, you might also want to look at the LEGO Mindstorm EV3. My 4th grader competes in the regional FIRST Lego League competition for Houston this weekend, and they use the EV3 robot. You can read more about their experience with FLL here. Wonder Workshop’s Dash & Dot are controlled by an app on your phone or tablet. You can program them using a visual block based app, or you can play one of the games that are available. Along with movements, sounds and lights, you can purchase accessories such as a Xylophone that Dash can play. Sphero is an app controlled robot that allows you to program with visual blocks, then see the actual c-based code that you wrote. Our school has the Sphero SPRK Edition, which is fun since you can see what’s inside and how it works. While all of these robots and programs are very useful in schools to aid in their STEM curriculum, we shouldn’t just limit technology teaching to school. These robots and games make learning fun, and it’s just as easy to have fun at home with mom and dad! They make excellent birthday and Christmas gifts for the kids who have everything! Grandparents love to buy educational items, instead of just video games. Take some time, invest in the future of tech, and watch your child’s face light up with joy! It’s here, it’s finally here! I know most of you have already downloaded the binaries and started installing or upgrading your test environment. It’s just too tempting not to, right? 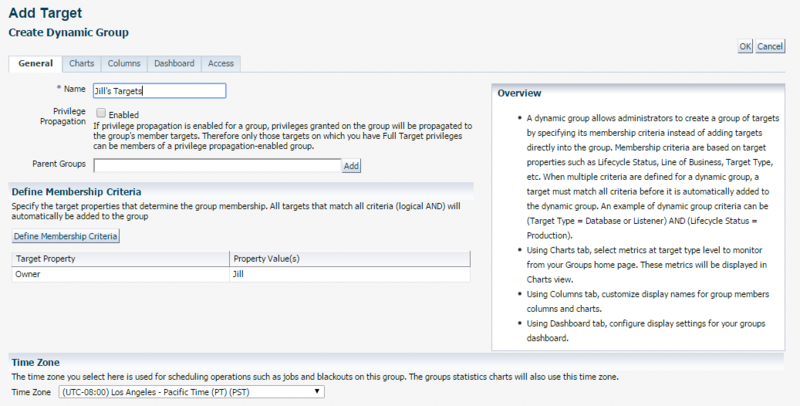 One question I’ve heard over and over since Oracle Enterprise Manager 12c came out… Can I use User Defined Target Properties in my Dynamic Group and Administration Group? Sadly the answer has always been no. Until now. Now, the answer is proudly YES! One of the small but powerful new features in EM 13c is the ability to use your custom target properties to define the Dynamic and Administration groups! This will work with global target properties, the ones you set as target_type=”*”. The target specific properties won’t show up in the select list. Small compromise I think! 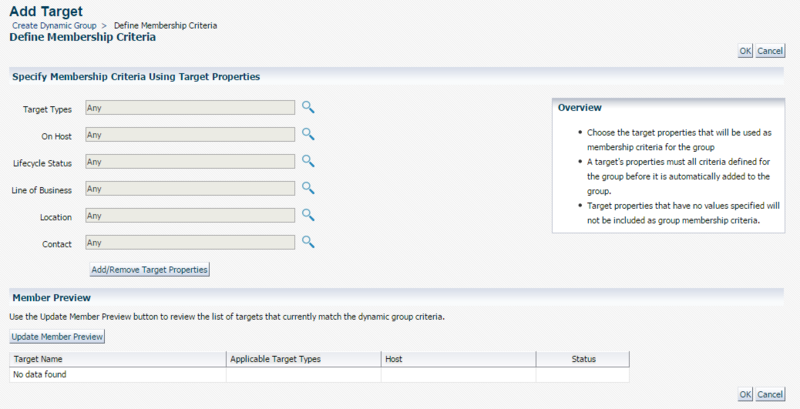 First, create your custom target property with emcli command. 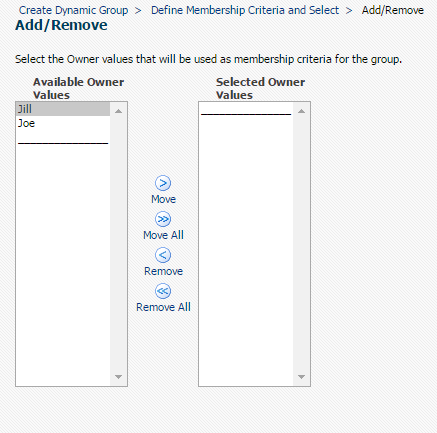 Next, create a Dynamic Group and select the Define Membership Criteria button. You’ll see a list of the default target properties. Click the Add/Remove Target Properties button. In this list, you will now see the Owner target property that I created earlier. Select the box and click Select. Now, you need to set which values of this property you want to be added to this group by clicking the magnifying glass next to Owner. Since this is Jill’s group, we’re going to select Jill, click Move and then Select. Now we see, that this group is going to contain any targets owned by Jill. Final step is to review membership and click OK.
Now that the group has been created, if Jill own’s any targets, we’ll see them listed in her group. Another big enhancement is the ability to create a list of values to more accurately store your target properties. Say your Line of Business has DBA, MW, and App. However, admins keep entering the wrong values. These won’t get used in Dynamic or Administration groups because the values were not expected. Targets exists with values set for this property. Run the same command with -copy_from_targets flag to copy all values to the master list. If your targets are already using this property, you’ll get the error message above. Update your emcli command to include the -copy_from_targets flag. 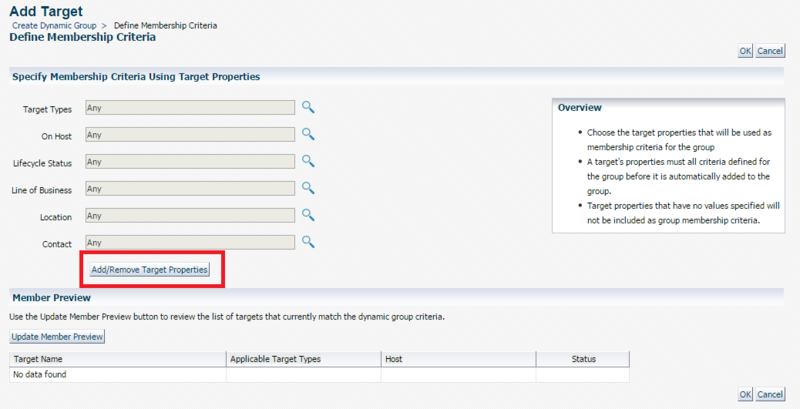 To see the target properties, on any target go to the target menu, then Target Setup / Properties. Click Edit to update properties. As you can see, there are no values listed for Location target property. To see the valid values, you can use the list_target_properties_master_list_values command. For more on what you can do with Target Properties, you can see my previous post here. I think with these two enhancements to target properties, EM administrators everywhere will smile a little brighter tonight. Enjoy! 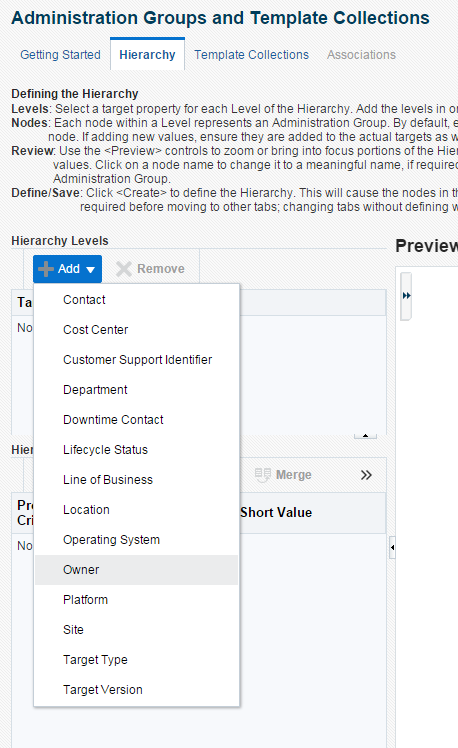 Enterprise Manager 13c – What’s New and What You Should Know! You may have heard by now that Enterprise Manager (EM) 13c has been released and you can’t wait to get your hands on the new updates and see what it’s all about! Here’s a few things you should know! What’s With the New UI? Just when you got used to the changes in EM 12c, they go and change it all up again right? Well, change can be hard, but in this case, I think you’ll appreciate a few things. The overall theme has been updated to match that of other Oracle Products. Focus is on presentation of the data, so more charts, callouts of number of incidents/errors and tiles that help you get to important information quickly. Where did my menu’s go? Instead of a menu on the left for general use, and admin features on the right, the menu bar has been consolidated to the right side of the page. Once everyone gets used to this, I think that it’s going to be a lot easier to navigate and more consistent. Even I had a hard time remembering, was it on the left menu or the right? This will take a little to get used to but I think it’s much more user friendly. 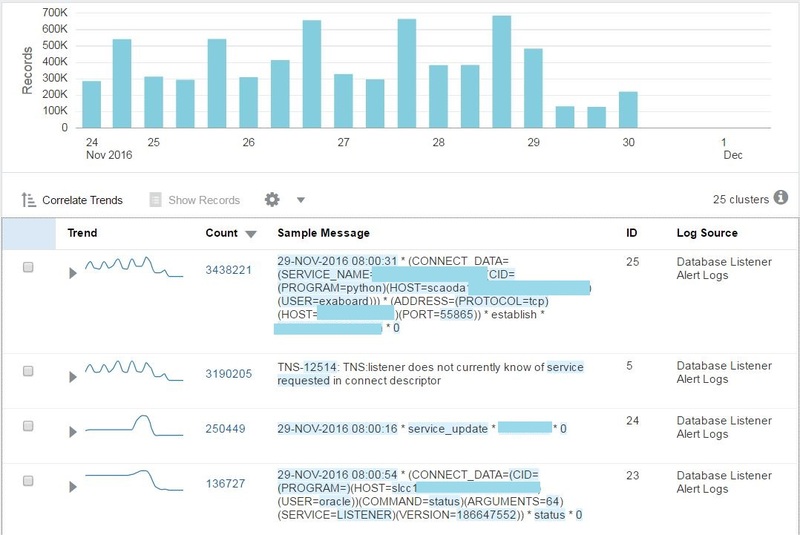 (Enterprise) – Monitoring, Jobs, Reports, Patching, etc. (Target) – All Targets, Databases, Exadata, etc. Setup – Security, incident rules, add targets, etc. Next you’ll see the Search icon, when you click on the magnifying glass, a search box will appear. This can be used to search for any target. The is new, this will take you to the Notification Center, one of the new features we’ll discuss more later. Finally you have the User Menu where you’ll find user preferences and logout. What versions of WebLogic and Java are installed? The infrastructure stack for WebLogic is now 12.1.3.0.0, and Java is version 1.7.0. Both are deployed during the Enterprise Manager install. Direct upgrade from Enterprise Manager 12.1.0.3 and higher will be supported. The Repository database needs to be upgraded to DB 12.1.0.2 first. If you’re still on EM 10g or 11g (we need to talk), you need to upgrade to EM 12.1.0.5 first before you can upgrade to 13c. Is there a 2-system upgrade? No, unfortunately, there is no 2-system upgrade so a full downtime will be required. Can I use my 12c Agents? Yes, if you’re agents are 12.1.0.3 or higher, they are compatible with 13.1. However, you should plan to upgrade the Agents as soon as possible to take advantage of new features. Always On Monitoring Service – A separate service used in planned downtime, will receive target availability and send limited notifications. Agent Gold Images – Create a standard agent and mass deploy updates with ease. This will cover provisioning, upgrading and updating agents. I will be posting about this separately, in detail. Corrective Actions – Support for corrective actions on all event types (beyond just metrics), and out-of-the box customizable Tablespace corrective action. 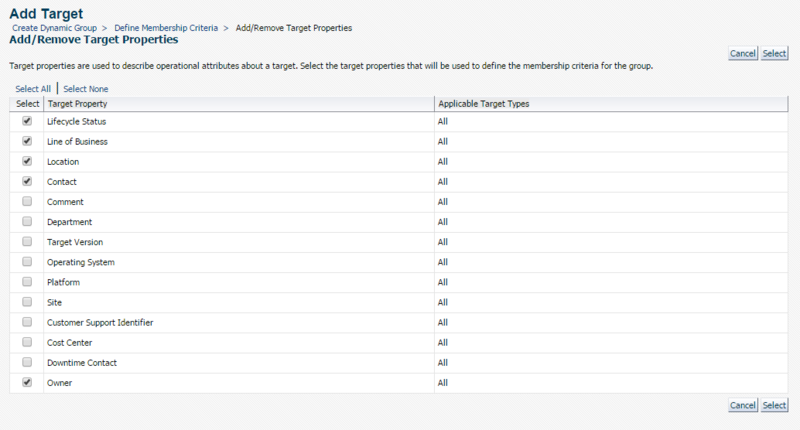 Target Properties Master List of Values – Define a list of values for your target properties. 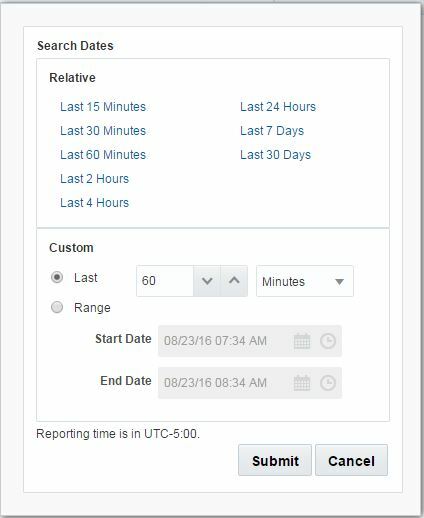 Incident Manager – New dashboards and export incident rules. Enough said. That’s a quick summary, but I’ll be blogging about more features in detail. In the meantime, takes sometime to review the New Features documentation.